Party boats are one of the most amazing ways of exploring the mesmerizing and breathtaking beauty of Costa Rica. These give you a refreshing view along with some exciting sports activities and tour opportunities. 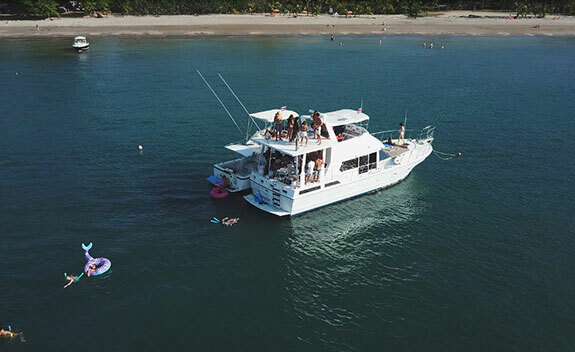 We will take you through the beautiful Pacific Ocean in a party boat which is equipped with state-of-the-art facilities and served with best-in-class services to make for a luxury cruise in Jaco. Catch a stunning sunset and try snorkeling when you are done soaking up the sunshine on the island’s sandy beaches. We help you arrange some crazy boat parties and customize them for more fun & adventure. Our well-trained staff serves for an unbeatable partying experience. Dancing reflects the pure joy of celebration. Thus, our professional DJ’s make you groove to the beats of the latest party numbers. Well-equipped with latest equipment and accessories to set the party momentum right. They play exciting songs, remixes and set the right ambiance for everyone to dance. They compel everyone to dance all night long. Vast knowledge of situational songs and play them at the right time. Drinks are the base of any rocking boat party. We make sure our courteous bartenders serve you with the finest drinks mix of your choice. Professionally trained bartenders to serve you with utmost warmth. Extensive range of Wine, Rum, Vodka, Tequila, and Beer available for your choice. Also provide you with drinks essentials like ice, mixers, cocktail napkins, and cups. We employ only highly-experienced captain and crew members who are trained at sea and can take required actions as situation demand. Our captains come with a professional sailing experience of more than 20 years. We keep 2 mates who are bilingual to understand your language easily. They are technically sound and well-equipped to tackle any difficulty. Mates assure warm hospitality for an unforgettable experience.